Congratulations to all our 2016 Sealed With A Kiss brides! This year has been filled with fun, laughter and excitement thanks to all of the 2016 brides we had the pleasure of working with. We are so lucky to have met such amazing women, and we are so touched that they let us play a small part in making their big day wonderful. Here’s a quick review of some of our most memorable weddings this year! Sealed With A Kiss Richmond bride Kerri married Paul on October, 22nd, 2016 at the Tuckahoe Plantation . Kerri chose a stunning strapless ballgown by Justin Alexander Signature for her big day. She looked stunning! We loved every minute we spent with Kerri to make her dress just perfect, and are so happy that her wedding day turned out to be everything she dreamed it would be. Congrats Kerri and Paul! The new year is almost here, and with it we’re expecting a new set of designs from our designers. We saw many of the new designs at fall bridal market, and have seen “sneak peeks” of the designs expected to be showcased at the upcoming spring market, so we wanted to share what wedding gown trends you can expect to see during 2017. Gowns with ruffles have been scarce for a few years, but designers are bringing them back! For brides who think that an all-over lace gown or all-over beaded gown are too much, but don’t want a plain skirt, a ruffled skirt is a beautiful way to complement a more fitted bodice. We are so glad designers are sending us gowns with ruffles again! Off the shoulder necklines are so flattering, and we feel like we don’t see enough of them on wedding gowns, so we’re glad some of the designs from upcoming collections we’ve seen have featured them a lot more! Plunging necklines are another trend we’re expecting to see a lot more of in 2017, with designers taking a chance on more sultry looks. 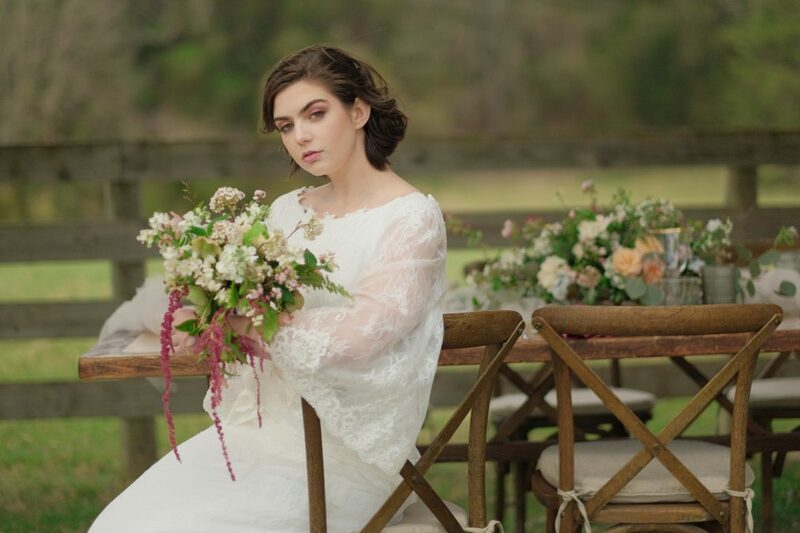 We can’t wait for our brides to fall in love with some of these styles! Detachable pieces have often been popular, but they were usually considered accessories that had to be specially ordered or custom made to go with the dress–but we’re noticing that 2017 is bringing us designs that already come with detachable skirts and capes, allowing brides to change up their look between the ceremony and reception without added time or costs. This is one trend we’re really happy about! Designers are also showcasing designs with higher necklines in a variety of styles! Whether you’re looking for a glam style or you’re more boho chic, there’s a high neckline gown you’ll love coming out in 2017. Question: I just got engaged (yay!) and am planning on visiting my first bridal shop this weekend, but I’m not sure what to expect. How does shopping for a wedding gown work? Depending on the day and time, bridal shops might not be able to take walk-ins, so it’s always best to call a few days ahead of time to make an appointment. Start shopping early! We usually recommend ordering the dress 6-9 months before the wedding. If you’re shopping closer to the wedding date (less than 5 months) it may not be possible to order a new gown for you and you might need to purchase a sample gown off the rack and have it altered to your size. One of the first questions you will get asked is what price point you want to stay around, so before you go you should have an idea about how much you want to spend on the dress. Wedding gowns can cost anywhere from a few hundred dollars to a few thousand dollars, so your consultant won’t know which dresses to show you unless you’re honest with her about what you can afford. Nothing’s worst than finding the most amazing dress and then realizing you could never actually buy it. Your consultant will usually come into the dressing room with you, so expect to get undressed in front of them. We understand that having a stranger see you in your underwear might be uncomfortable at first, but getting into the dress alone or with someone who doesn’t know how to fit it can be difficult. You’ll be happy to have a consultant who knows what they’re doing in the dressing room to help you. Now I’ll go over what happens during each portion of the appointment. Things will vary from store to store, but this should give you a good idea of what to expect during your shopping experience. Typically when you walk in you will be greeted by a consultant or stylist who will sit down with you and want to know all about your wedding and what you have in mind for a gown. They’ll ask what kind of look you’re going for (i.e. vintage, casual, modern), what styles you like (mermaid, ball gown, strapless, etc) and what your price point is. As I mentioned, it’s best to have a good idea of your price point before you go to your appointment but if you don’t have styles in mind yet that’s okay, especially if it’s your first time looking for wedding gowns! It’s often hard to know what you like and what you don’t until you’ve tried a few styles on, so just let your consultant know that you’re open to styles and she’ll choose a few different kinds for you to try on. Now comes the fun part–trying on dresses! Some stores have all their dresses in an area you can peruse through so that you can pick out styles you like, others will have their dresses in a different room or storage area and your consultant will choose which dresses to bring out and show you based on the styles you discussed. Keep an open mind when deciding what dresses to try on, as things often look different on your body than on the hanger. Ask your consultant to suggest styles and cuts that will suit you, even if it’s not necessarily what you had in mind. Brides will often choose a dress that is totally different from what they initially thought they wanted, so it’s good to see all your options! As I mentioned in the things to know before you go section, you shouldn’t be surprised if the consultant joins you in the dressing room to help you get in and out of the dresses. As you try on each dress your consultant will tell you a little bit about its design, color and customization options. You should be honest about what you think and feel about each dress so that your consultant will know what style to have you try on next. Keep in mind that many dresses can be changed or altered to better suit the look you’re going for, so if you wish the dress had different sleeves or you wish the design was a little bit different, ask if it’s something that can be done. You might find the dress at the first shop you visit or you might need to visit two or three more shops before finding “the one”–the process for each bride is different! Whenever you do decide on the dress, the consultant will go over sizing and ordering with you. To determine the size you need to order they’ll take your measurements and compare them to the size chart for the designer of your dress–bridal sizing runs one to two sizes smaller than normal clothing sizes, so don’t fret if you come up a size bigger than you thought! Most brides will come up between sizes on the size chart and most places recommend ordering the bigger size. This is because dresses that are big can always be taken in, but if the dress is too small it can only be let out so much. Some designers offer custom sizing and/or custom hem length for an additional charge, and though it adds to the price tag you’re paying up front it will likely cut down on the cost of any alterations needed later. Once this is done your consultant will go over the store’s ordering policy. Since bridal gowns are made to order, most stores have an all sales final policy on all bridal designs. Some stores require partial payment of your dress to order it, others will require that you pay in full before you order. Remember that a dress can take months to come in, so if you need to pay in full before ordering it’s best to do so as early as possible to be sure your dress arrives with plenty of time for alterations. Though the gown is being ordered in your size it might not be the perfect fit when it arrives–the hem might need adjusting, it might fit in some places but be a little tight in others, or you may have changed weight since you ordered. This is why your wedding gown will need alterations. Your bridal shop will either have an in-house seamstress or will recommend a seamstress who has experience altering wedding gowns to you, and will set up a time for you to begin alterations. Here at Sealed With A Kiss we tell our brides to begin alterations six to eight weeks before the wedding, but recommend starting earlier if your gown needs major work (like adding or removing an illusion neckline or taking it in more than two sizes). Keep in mind that alterations are typically not included in the original price of the dress and the cost will vary depending on the gown’s construction and the difficulty of the alteration. Sealed With A Kiss Richmond bride Jody married her now husband Frank on September 17th, 2016. From the setting to the decor, to the adorable unicorn pictured above, their wedding was straight out of a fairy tale. They even had performers from Moonlight Circus put on a show for the guests! For her big day Jody chose a stunning gown from Casablanca Bridal that we helped her customize for a unique and comfortable look. We are so happy to have been a part of making Jody’s big day special, and we wish her and Frank many happy years together. If there’s one fabric associated with wedding gowns the most, it’s tulle. It’s versatile and light, so it’s no surprise that it’s a bride favorite! No two tulle gowns are alike however, and almost every bride can find a gown with tulle that she loves. Below check out some of our favorite tulle picks! This airy and elegant ball gown features layers of French tulle and hand loomed French lace. It’s a romantic look brides love! This gown takes tulle to a new level of cool. This sweetheart neckline gown features a “cage” silhouette, with tulle draped over lace. This tulle gown is the definition of understated elegance. The a-line silhouette of this gown is complemented with a boatneck ruched bodice and tulle sleeves. This gown is all about the details! It features an illusion Sabrina neckline over a deep v cut, and the bodice is adorned with lace and beading. The full tulle skirt provides lots of movement, and will flow beautifully as you walk down the aisle. Brides love how the corset style bodice of this fitted gown contrasts with the soft, flowy tulle of the skirt. It also features delicate French lace, and brides love how beautiful they feel when they slip into this gown. The tiered tulle skirt of this effortless look is so dreamy! We also love the lace accents along the sweetheart bodice and along the hem of each tier. This a-line gown features a lace bodice with off the shoulder sleeves. It’s sure to make you feel like a princess! This fitted silhouette is perfect for the bride who wants to sparkle on her big day! The crystals on the bodice are beaded in a beautiful geometric pattern that pairs nicely with the tulle mermaid skirt.